Flower Resin is a clear, flexible, slow curing epoxy resin which provides that crystal clear water effect. Formulated to provide the final quality touch to your finest floral silk displays. Flower resin, also known as Aquallusion, has very high UV resistance for maximum clarity life. Avoid prolonged exposure to direct sunlight whenever possible. The flexibility and slow curing (24 to 48 hours setting time, depending on the mass and shape of the casting) is specially designed to prevent shrinking and eventual cracking of the glass vase. This resin must set in about 48 hours or longer. If your resin is setting too fast, it may result in shrinking and discolouration. Either the ambient temperature is too high or the quantity used in your arrangement is too high. The solution is to switch to a slower resin system. Consult our tehcnical department for advice. 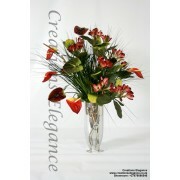 Please test our resin for your particular type of flowers and vase sizes before going into production. We have the expertise to modify our resins to suit your needs. Available in kits packing or in bulk.